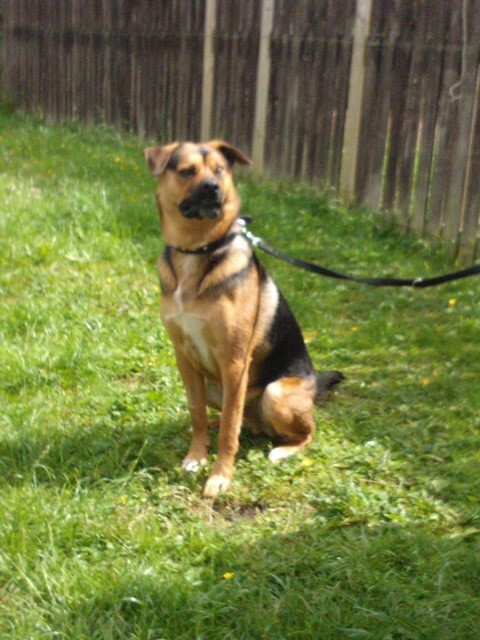 Cesar is a GSD X and at only 19 months is looking for a new home where they can provide a quieter environment for this boy. Currently, he shows anxious traits within the busy house he lives in, some people he is fine with, others he can be vocal. Cesar is a much-loved boy but owners unsure how to cope with this behaviour and feel he is best rehomed to more experienced folk. Our volunteer was greeted well and Cesar was happy to have a fuss. It was obvious during the assessment that Cesar likes to get his own way and demands attention from the owner (who gladly gave him a cuddle). Outside Cesar was walked down the road he lived and passed several houses with dogs in the garden, he reacted by trying to lunge and bark, although we are told once he knows a dog he can be fine and settle. Continuing the walk down an unfamiliar road it was obvious that Cesar began to lack confidence and showed signs of nervousness, he jumped at some noises in one garden but once calmed and reassured was happy to walk on and get back home. All in all a youngster that will need a patient new owner who can give Cesar the direction he needs to relax and just be a happy hound.